The 2012-13 NHL season may have been short, but it was also memorable. All the heroics and dramatics culminated with the Chicago Blackhawks hoisting the Stanley Cup for the fifth time in the franchise's illustrious history. 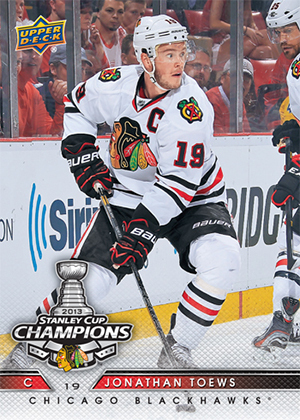 The 2013 Upper Deck Chicago Blackhawks Stanley Cup Box Set is a straightforward release that captures the team's impressive run. The set includes 25 player cards. Conn Smythe winner Patrick Kane, Captain Jonathan Toews and goalie Corey Crawford are among them. There are five Season Highlights cards as well. The set has its own design, but it falls in line with the flagship Upper Deck hockey line. 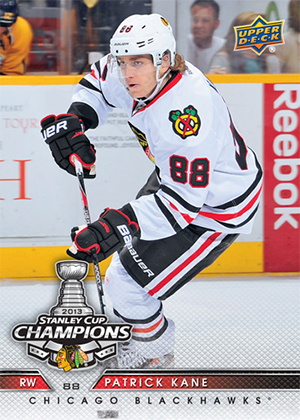 Cards come with a Blackhawks Stanley Cup logo. Every 2013 Upper Deck Chicago Blackhawks Stanley Cup Box Set also has an over-sized box topper card that shows a group shot of the team celebrating their Game 6 victory. This is the first Stanley Cup box set in two years. Featuring 30 cards, including 25 base cards, 5 season highlights. One 3-1/2" x 8" card per set. 2012-13 STAN MIKITA ITG SILVER ENSHRINED AUTOGRAPH! #13 19! CHICAGO BLACKHAWKS! BOBBY HULL SIGNED 12-13 PANINI CLASSICS SIGNATURES BLACKHAWKS CARD AUTOGRAPH! !